Texas Wild Life - a series. Dove Key Ranch Wildlife Rehabilitation, Inc.
On Dove Key Ranch Wildlife Rehabilitation, Inc.
Wildlife rehabilitator Bonnie Wroblewski is founder and director of Dove Key Ranch Wildlife Rehabilitation, Inc. Graduating with a BS in Geology and Geophysics from Yale University in 2002, Wroblewski began graduate studies in paleo-ornithology at the University of Chicago only to discover her true calling in life as a wildlife rehabilitator following a summer internship at Willowbrook Wildlife Center in Glen Ellyn, IL. 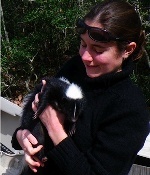 After working as a keeper at AZA-accredited Cosley Zoo (Wheaton, IL) and a wildlife rehabilitator at Willowbrook Wildlife Center, Wroblewski moved with her husband to Colorado County, TX and founded Dove Key Ranch Wildlife Rehabilitation, Inc. to care for the wildlife of southeast Texas as well as to educate the community on humane ways in which people can co-exist with their wild neighbors. Bonnie Wroblewski has also volunteered for the Brookfield Zoo (Brookfield, IL), Marine Mammal Conservancy (Key Largo, FL), International Crane Foundation (Baraboo, WI), Bluebonnet Equine Humane Society (TX and AR), and National Oceanic and Atmospheric Administration/National Marine Fisheries Service sea turtle facility (Galveston, TX), and is a Texas state representative for Skunk Haven Skunk Rescue, Shelter, and Education, Inc.